The good news is that John Hurt — a living legend whose work I’ve always enjoyed, most recently in The Proposition and V for Vendetta — has joined Harrison Ford, Cate Blanchett, Ray Winstone and Shia LaBeouf in next summer’s Indiana Jones installment. 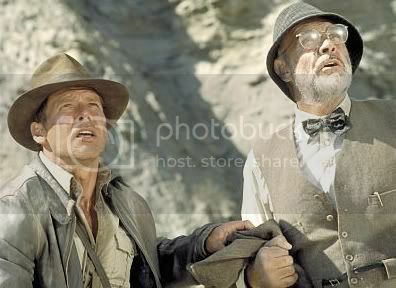 The bad news is that Sean Connery will NOT be back as Dr. Henry Jones, Sr.
Connery is a huge part of why Indiana Jones and the Last Crusade is one of my absolute favorite films of all time. It’s so much fun, and Connery’s work in the film goes a long way toward making it so. Now we’ll probably get some lame explanation of how Henry died off-screen. The plot and the title are still top secret, though with the film less than a year away I’m sure news and other bits of info will start rolling in soon enough. Indiana Jones IV arrives sans Connery on May 22, 2008. Now if you’ll excuse me, I’m off to drown my sorrows in a $15 thing of candy beans. Video and info from today’s Batman press conference! Batman press conference in Chicago tomorrow!